Black sheep of the family is a self-portrait, with a twist. 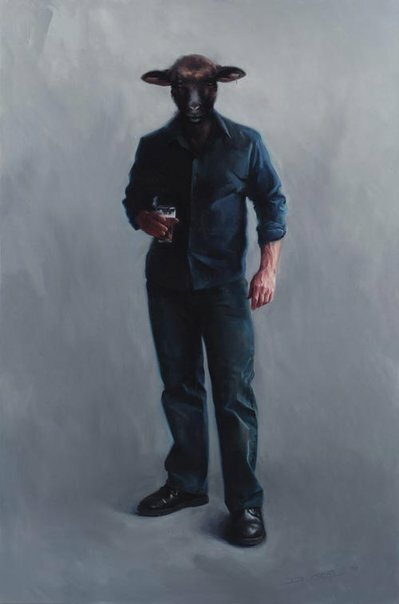 Crothers is a painter who seeks to define the Australian culture ironically and symbolically from the viewpoint of an engaged commentator. Using representational images from Australian culture together with his knowledge of art history, he recombines apparent reality into visual concepts that comment on the human spirit. Born in Ouyen, Victoria in 1967, Crothers now lives in Bendigo, where he shares his painting time with his wife, three children and six pet animals. He studied fine art at the Julian Ashton Art School along with Graeme Inson, the tonal impressionist. He received the Alice Bale Travelling Scholarship in 2003 and was an artist exchange participant in the 2006 Fleurieu Peninsula Biennale. He won the People’s Choice Award in the James Farrell Self-Portraiture Prize (2006) and an award for outstanding composition at the Bendigo Rotary (2003). This is his first time as an Archibald finalist.